Shortly after we moved in, the city started doing work on our street. It was a minor inconvenience. It closed off one lane and made parking a bear. But it was supposed to be short lived. Then the jackhammers started just before 7:00am. WTF?!?! A few well-placed questions landed us the answers: there was a gigantic sink hole under the road. 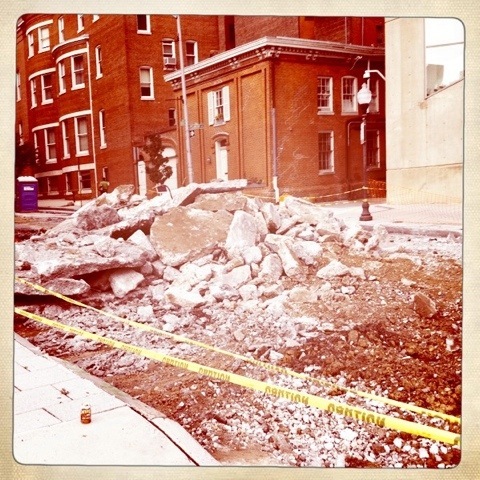 And so, the entire street was blocked off and dug up. Yep, the entire thing. They’d get “done” and start to cover things back up, then have to dig it all up again. So tonight, BGE is outside, digging up all the work the city has done thus far, madly searching for the leaking gas line.